I am new to IOS music making, but not new to music making and I'm wanting to try orchestral music on IOS. I have an iPad Air 2, 128GB. Also have Auria Pro, Cubasis, Sampletank with Miroslav 1. I also have loaded Sonatina Symphonic into Auria Pro. Any advice for a noob? I know it won't be quite as easy on IOS as it would a pc, but still wanting to make it work. I don't have much experience with orchestral compositions, but Garageband app has a pretty good (imo), user friendly string section. Individual instruments, plus "smart" instruments that can make some pretty nice sounding music. It also has oboe, clarinet, french horn, etc. I'm guessing based on the items you already have loaded that GB may not be of use to you, but you referred to yourself as a noob so I figured I'd throw it out there. It sounds like you already have what you need to get in there and start workin'. If you're planning to click MIDI in for the instruments to play I'd suggest spending time investigating what continuous controllers (CCs) are available, how to add/edit them, and how they shape the sounds over just the "note on/note off" of a typical piano roll. 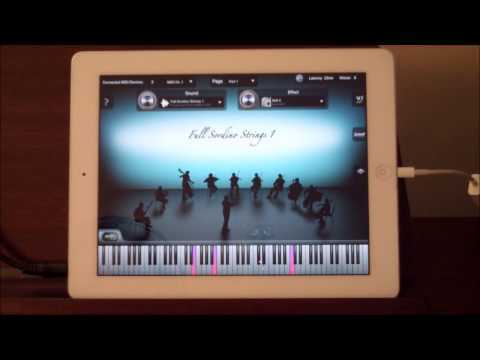 Will you be recording live orchestras, composing with notation, recreating orchestral sounds with apps, or ... ? I don't know if you read music, but it can be quite instructive to get the score for a piece of music that you like and use that to follow the music, and to see how the composer combines different sections of the orchestra for different sounds and feelings. But equally, if you just make it up as you go along, you might come up with something totally original! If you do do notation, I would suggest getting Notion, and springing for the sound packs. Check out the notion group on Facebook, you'll find lots of fellow souls there. You can write or import musicxml in notion, export as midi and import into auria. Miroslav Philharmonic 2 in Sampletank has great sounds in it. Thought I would record in one track at a time one instrument on a track with midi and midi keyboard. Seen it done in videos with Reaper and an orchestral library. I have heard about two apps, thumbjam and Notion that might be good for sample sounds. Notion looks interesting, basically a sheet music app? I'll check out the Facebook group. Thanks! Oh..About Miroslav 2, sampletank is only 8 part multitymbral...Not sure I can make a whole orchestra with it? The major problem you will face - depending on what you want to do as @decibelle said - is to handle articulation and expression changes. Essentially, instead of being able to have all the MIDI for a score - even for a single instrument, say a solo violin, on a single MIDI track and then use keyswitches to select among the voices for articulations and expressions, you have to break out the SSO articulations and expressions among multiple tracks - note by note per expression / articulation where they occur - i.e. jumping among the different voices on the different tracks. Consider, say, a 150 bar piece where there are many changes just from pizzi to staccato to legato and back, sometimes in the same bar. Since one has to separate out the SSO or other instrument voices per articulation (i.e. a different SSO instrument per voice each in its own MIDI track to handle the articulation / expression), how are you going to manage all those changes? There is no easy way to handle this in a single track because there is no keyswitch mapping approach on iOS as there is on the desktop. How are you going to drive those tracks? Are you going to load MIDI from the output of a notation program? If so, how are you going to separate out the articulations? You have to manually split up the single track note by note across the voices you just loaded above. It's very very painful to do that for anything more than a few bars, let alone 150. So, OK, you think: "Hmm. I'll drive it from something else, say record in the MIDI from a keyboard and send the MIDI channel changes somehow" (maybe you can do that with a keyswitch on some MIDI keyboard). Let's say you have multiple articulations / expressions for your solo violin - let's take 4: legato, pizzicato, spiccato, staccato. Let's now say you dedicate 4 MIDI channels to those. How many instruments can you add until you run out of MIDI channels? Just 4. That's it. You've already run out of MIDI channels. A string quartet and you're toast. OK. So, maybe you think. Aha! I'll use a single instrument that has multi outs - much like you would use Play or VSL Ensemble or Kontakt on a desktop machine. Then I'll load each one on a track and send MIDI to those to select articulations. There are not any instrument collections for iOS that have close to complete articulation sets. iSymphonic Orchestra comes closest. But that'll cost you a lot of $$$ by the time you've bought all the IAPs and is still incomplete. (I don't own it for that reason - not economical on several levels for what I would want to do with it - and incomplete). However it is a part solution - esp. now that it can work as an AU and the devs have done a good job with it - not knocking what's been attempted. You can load one instance of it per instrument or set of instruments if your articulation choices are smaller, and then use separate MIDI tracks in Auria Pro to send to the same instance. You still have to separate the articulations / expressions out though across multiple MIDI tracks in Auria Pro - even if you're driving a multi-instrument like iSymphonic. BUT... ! a further problem you'll quickly max out your iPad: in "disk" to store the samples if you get a lot of IAPs, in sufficient RAM to run enough AU instances in parallel and in CPU. The iPad simply hasn't got enough oomph to do that over multiple articulations / expressions - even an iPad Pro - over much more than a small chamber ensemble kind of variety. However ... There is a solution that's better than those kludgy and inefficient approaches - and that's Notion. I do most of my orchestral scoring in Notion on iOS because it's simply the best solution for the problem. It's also a pretty decent scoring program anyway But, beyond that, the LSO samples in Notion are actually pretty decent (although the solo violin's a bit squeaky for my taste). The biggest benefit is that it handles all of the articulation, expression and dynamics right from within the score. Notion is the only real solution to orchestrating where you want to preserve the articulation, dynamics and expression (Symphony Pro too, but Notion is the more mature product at doing this, and as I say, has a sample library that's based on the desktop LSO samples). Which, all leads me to admire what the Notion folks have done. Yes, it has the disadvantage that it's a locked in solution - i.e. both notation / MIDI and rendering are all in the same app, but, it's a very workable solution for all that. Plus, although you can export MIDI from Notion and import that into Auria Pro, you can't directly send MIDI from Notion to Auria Pro, and, even if you could, what would you do about separating the articulations / expressions. Round and round we go... Did I mention painful? As a result, though one of my main foci is doing orchestral work - and even on iOS - I do not own iSymphonic Orchestra. I've also not bothered with the Miroslav 2 samples for SampleTank (not to mention it's not an AU, and not to mention it only has a single stereo out). I have played with the SSO, VPO and VSCO2 samples in Auria Pro but have given up because of the separation issues I've mentioned. I do have Notion - including the complete IAP set. Further - more detailed rendering - I do on the desktop, (using desktop libraries - higher resolution samples and many more of them - 100s of GB for a single vendor's orchestral library alone usually). And, I've also played with interactive work with Thumbjam (and a little with SampleTank with other orchestral samples - I did get the Miroslav 1 IAP when it came out originally, then realized the issues and stopped making the attempt a good while ago now.) Interactive stuff can be fun to do. Sure not knocking that - all good. Hope that's vaguely helpful. Been here doing / done this a bit. I don't do it on iOS in any serious way except in Notion. Here's what I did with SSO instruments in Auria Pro with K201. At least the 1st 42 bars. It's lacking any breakout into separate articulations / expressions - like I said very painful to do - so this is in fact all using legato instruments. This was an experiment. I would not take this approach moving forward for anything even approaching this complexity. Notion all the way. Not compared to my Garageband tip. I don't want to render something too complicated...Just stay within the capability of the library. That being said, I'll have to work around some bugs in Lyra...fil_veltrack opcodes cause problems, but I can use automation as a work around. Just have to manually put it in. And thanks for everyone's input! Very helpful! Yes - that can be done. With SSO and Auria Pro. No problem. But, as I said above, it's a lot of work for the reasons I mentioned. Here's a thread I started about using VCSO2 the other day. At the end you'll note I mentioned another similar thread over in the auria forums (I'll link that explicitly too) where the issue with the SSO samples was further elucidated. Yep..That's me that found that bug.